Tilt the steering wheel and unscrew the steering column cover (there's a second screw on another side). Remove the upper cover. 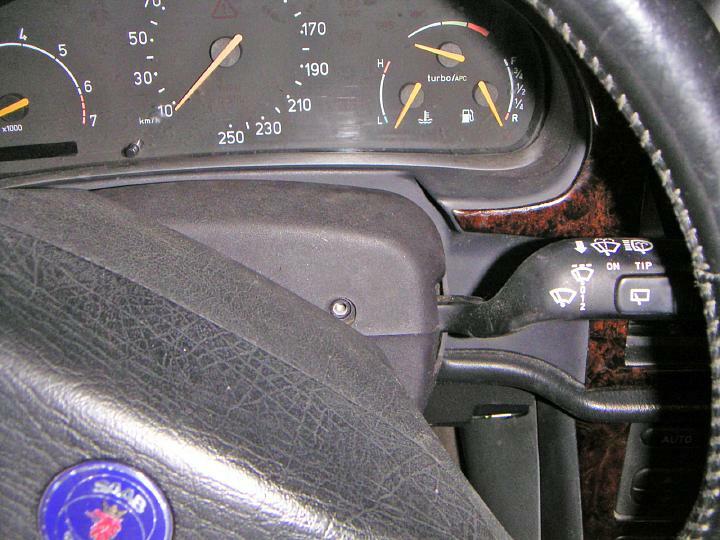 Dashboard and instrument cluster removal on a 1996 Saab 900 (the same applies to 1999-2002 9-3). My "Check Engine" light was not working, and I needed to replace the bulb. The pictures show the lower dash panel removed and the fuse box out -- this was a part of another job, and is not needed for dashboard removal. The only tool needed for the job is a Torx T25 screwdriver. Installation is the reverse of removal.